I don't know about you, but I can never get enough of infographics. Here's one that compares the known details about the various English language ebook markets (UK, CAN, USA, AUS). It also covers the relative sizes of the ereader, tablet, and smartphone ownership in the 4 countries. Most of the numbers look reasonable, like the number of eReaders in the US. Consistent with previous years’ estimates. Especially Kindles: 46 million readers total lines up with the estimated 30 million Kindle install base and the 60-65% market share generally attributed to Amazon. 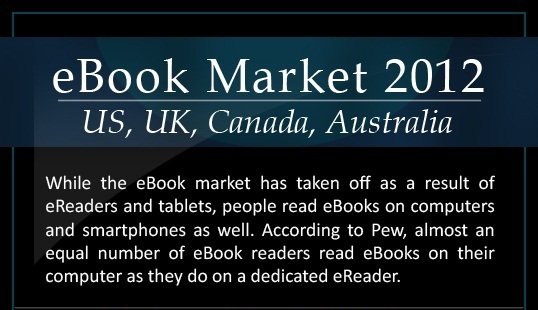 That puts Nook at about 12 million and Kobo, Sony, and generic ePub combined at about 4. Grr. I just spent an inordinate amount of time trying to figure out why the first chart doesn’t agree with the first graph. Evidently the circles-in-circles graph doesn’t show “Devices used by eBook Readers,” but rather just the ownership numbers for the various devices. Needs better labeling (or maybe I need more coffee). This article really doesn’t tell much. You don’t compare like figures. You give the total amount of money for paper books in Australia, then the percentage of ebooks. You can’t compare that. You give the figures for the US in 2012, which isn’t over, and figures for 2014, which has to be a projection or guess. I’m not saying your general ideas aren’t correct, but you can’t prove them from what you show here. It’s like saying people ate 100,000 oranges and adults bought 20% of the apples. It tells us nothing.